Where is Something Really Located? In one of the threads comparing the various online and PC and mobile device products that can be used for trip planning and navigating (two quite separate activities), there was a concern about the routing capabilities. 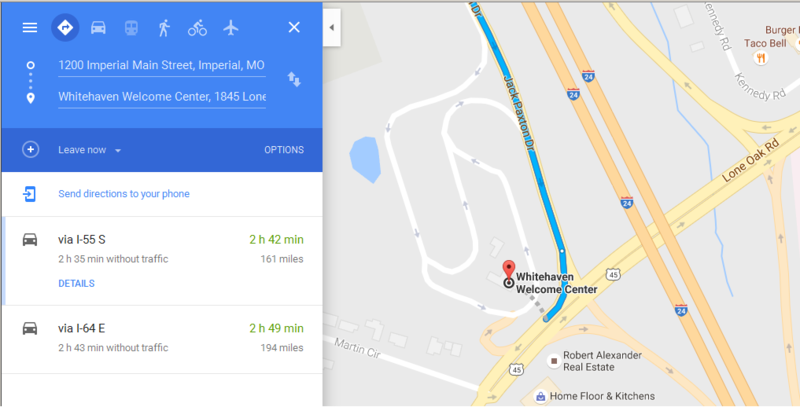 The example used was a drive from Imperial, Missouri, to the Whitehaven Welcome Center in Paducah, Kentucky. The issue was whether one or another of the products, if it had routing capabilities, would take you off on a useful exit to the parking lot of the Welcome Center, or simply drop you on the side of the freeway. I did some testing in Garmin's Basecamp PC planning product this afternoon and found that it's not the routing capabilities of the product but the location you give it. I can search in Basecamp and find the POI named "Whitehaven Welcome Center". I can search for its street address: "1845 Lone Oak Rd". And I can create a waypoint using actual coordinates: (N37° 03.067' W88° 39.202'). In Basecamp, as I suspect is the case with many other products with maps in them, the location associated with both the POI name and the street address are not at the exact location of the Welcome Center. So I've used the Basecamp Route tool to create three routes: one to the POI name, one to the street address, and one to the coordinates. Then I've displayed the three routes and the three waypoints on Google Earth. As you can see in the screen capture Garmin's map database has the POI name and the street address smack in the middle of the freeway so that's just where you would expect the route to end. The location coordinates are much closer to the actual location so Basecamp's Route tool is able to figure out how to take you there properly. You can also see that Google Earth has its own label placed much closer to the Welcome Center itself. in my other post in order to "help" some routing algorithms to take the correct exit. 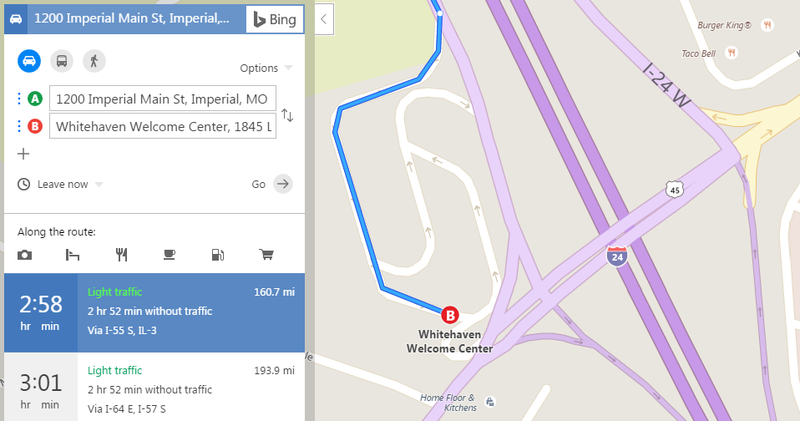 Only Bing maps found the correct exit withOUT that extra "help." Most others beside google do that a LOT, in fact, most of them do it most of the time: they map stores that sit a half-mile away from the nearest road only as far as the point on that road. Google only does that some of the time; in most cases google finds the actual store. in the case above, it got tripped up by not having taking into account that there's a specific exit for that POI, and it doesn't correspond at all to the street address. Google Street view cars evidently don't always enter rest area parking lots, or else their algorithms don't always handle exits that go only to rest areas. That's another way where driving all those Street View cars pays off. It's not perfect, but it beats the heck out of most of the others. And that's why google essentially owns local POI discovery. Yes. To all of that. I just wanted to make a distinction between good or bad routing versus good or bad locations. It looks like Garmin's routing algorithm is good if you give it good locations. But Google appears to mess up the routing even though it has the superior location.